Former Vol and Dolphin brought wife Rainey back to where she was a 4-time state softball champ. ENGLEWOOD, Colo. — It might eventually become easier for Ja’Wuan James if he was known as the league’s 9th-highest paid offensive tackle. That’s not how it works, though. The eight guys listed ahead of him are all left tackles. At right tackle, the Broncos made James the highest-paid last week with a four-year deal that averages to $12.75 million a year. An honor to be sure. But the first time he gets beat for a sack – and everyone does – social media will show no mercy. Is James ready for the lofty expectations that come with unprecedented riches? The NFL is forever making on-field adjustments to its game, but not in its accounting department. Many of the league’s best pass rushers like the Broncos’ Von Miller line up over the right tackle now. The left tackles often block weaker pass rushers, but the blind side generally gets more pay. At least James was able to push a right tackle inside the top 10. Money is one reason why James signed with the Broncos, but there are legitimate others. His trip here in his rookie season with the Miami Dolphins left a lasting impression. James started at left tackle that day. Ja’Wuan James and Rainey Gaffin met while attending the University of Tennessee on athletic scholarships. James started 49 of a possible 49 games at right tackle for the Volunteers. Gaffin was the Gatorade Colorado Player of the Year as a junior at Legacy High School for softball powerhouse Legacy High School in Broomfield. Don’t know why. All she did her junior season was post a 23-0 record and 0.98 ERA from the pitcher’s circle, play outfield when she wasn’t pitching, and bat .693 from the left side with three homers and 41 RBIs to help Legacy win its fourth consecutive state titles. It became five straight state championships after Rainey’s senior season at Legacy. Her mom, Dawn Gaffin, watched her every pitch and at-bat. And not just in games, but practice, too. Dawn, you see, is the real legend at Legacy. She is Legacy’s softball coach who has notched more than 600 wins overall and six state titles for the school. Her daughter Rainey was more left-handed hitting outfielder than right-handed pitcher her first two years at Tennessee. She finished as a third-team All American and significant other of the Vols’ star right tackle. They met when Rainey was a freshman; Ja’Wuan a senior. They got married three weeks ago – honeymoon delayed – and will set up the first years of their marriage near Rainey’s hometown. 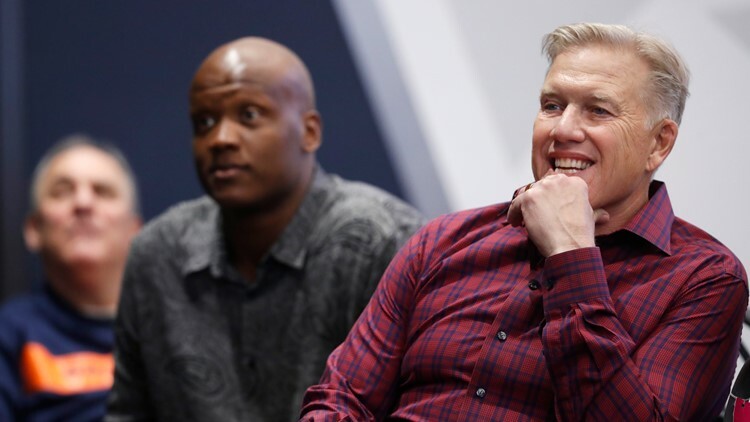 “It’s kind of surreal, eight years later we’ve almost come full circle that this is where we ended up,’’ said Rainey, who attended her husband’s introductory press conference Friday. James has a tall, athletic frame at 6-foot-6, 312. Or a little thicker than an NBA power forward. He doesn’t carry around the body fat of other offensive tackles, which will help as he moves out to do his part in the zone blocking scheme new offensive coordinator Rich Scangarello and offensive line coach Mike Munchak will teach this year. 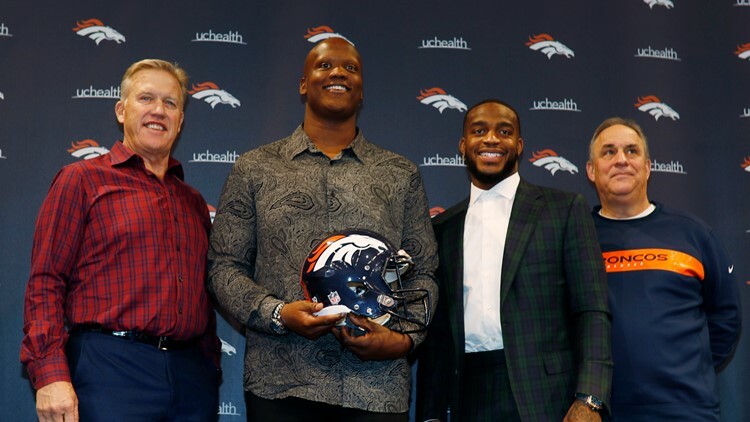 After spending four years in Knoxville, Tenn., and five years in Miami, James’ first day as a Denver Bronco was 48 hours after the bomb cyclone blizzard paralyzed the state. Living near the wife’s in-laws is great and all. But he’s sure about this?